To obey or not to obey. Have you ever asked yourself this question when it comes to God’s instructions? I mean, some things are “no brainers” like don’t steal and don’t kill, but what about the hard stuff? During the beginning days of the Christian church, the followers of Jesus Christ were very effective in sharing the story of Jesus’ resurrection from the dead. They had been called to share the message first in Jerusalem, then in Judea and Samaria, and then to the uttermost parts of the earth. There were many who believed their report, but many others who were not that pleased about the growth of belief. These messengers were given power from God’s Spirit Who endowed them with boldness to speak while convicting the hearers of their sin, God’s righteousness, and His judgment. The disciples received this power just as it had been promised to them by Jesus before He went back to His Father. He told them that they would not be left alone. Rather, He would send them a Helper who would guide them into all truth, tell them what to say, convict the world concerning sin, and glorify the Father through them. These men completely surrendered their lives to the One who called them to preach the gospel, and regularly prayed and asked God to grant them the ability to testify with confidence. God heard their prayers and in Acts 4:31 the Bible states that the place where they were gathered together was shaken, they were filled with the Holy Spirit, and began to speak the word of God with boldness. The next morning when the high priest and other religious leaders arrived, they were perplexed as to how the men had escaped. They brought them back for questioning and finally gave them strict orders not to continue teaching in Jesus’ name. 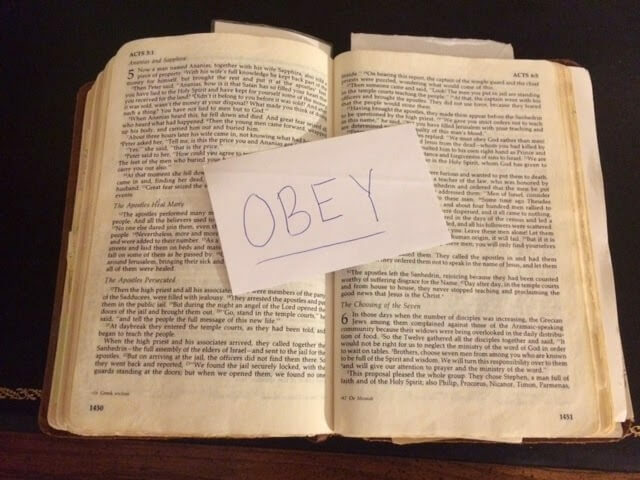 The disciples knew that they were in danger, and the obvious question could have been, “To obey or not to obey?” But Peter answered on behalf of all, “We must obey God, rather than men.” These devoted missionaries understood the cost of obedience and yet chose to follow God’s orders no matter the cost. God spared their lives, though they suffered a severe beating for their obedience. Strangely enough, in the midst of their physical pain, their hearts were happy. They went on their way rejoicing that they had been considered worthy to suffer shame for the name of Jesus and they kept on preaching and teaching. God calls each of us, also, to go into all the world and preach the gospel. He provides this same Holy Spirit power for living and sharing God’s truth as He did for the early disciples. Will we surrender our lives completely to God? Will we ask for the Holy Spirit to give us confidence and boldness? And will we make the right decision when faced with the hard stuff – to obey or not to obey? I hope the answer is yes because the spread of the Gospel depends on it.